Hoka One One shoes are kind of a big thing in running right now - it seems to me (and you can correct me if I'm wrong) that they are the opposite of the minimalist/barefoot running movement. I myself have never tried minimalist running (does it count that I would do Crossfit running workouts in my Chucks? ), and I understand the concept that primal man ran barefoot and didn't need stability shoes to correct his form, but honey... I doubt there's been a single minute of my life that I've lived like primal man, and after 32 years of being raised a modern woman (on modern, most-likely-genetically-modified, highly-processed food), I'm pretty sure that trying to run even a mile on little-to-no cushioning would be a bad idea. So my curiosity was definitely piqued when I first heard about Hokas, which have a lot of cushioning and look realllllly ridiculous. 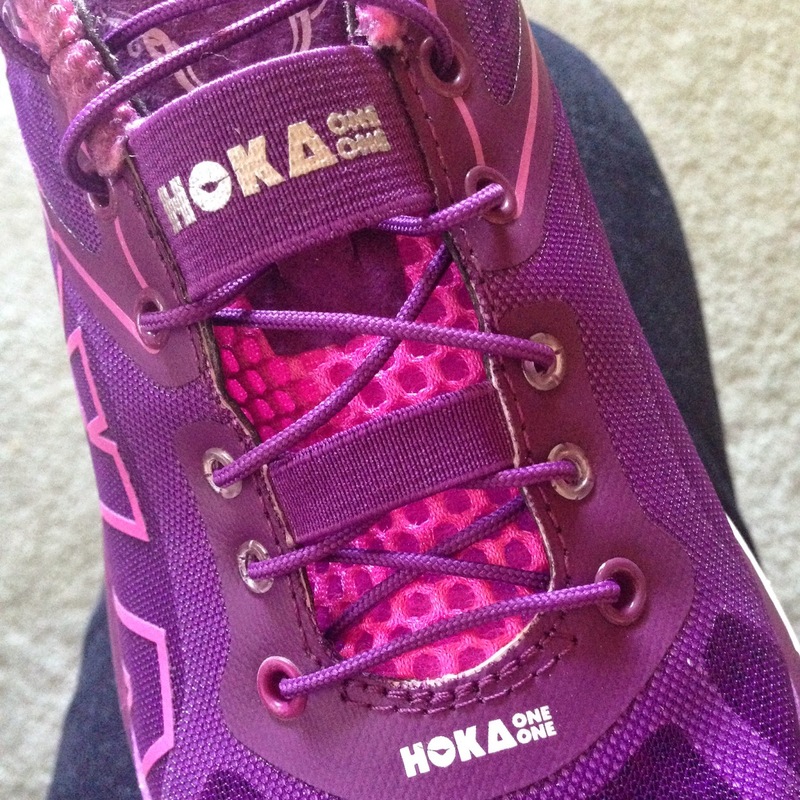 When Active GearUP recently had a bunch of Hoka styles on sale, I jumped at the chance, and ordered myself a pair of (women's) Bondi 3 shoes, which are the widest model they have in a road shoe. (I know they have since released the Bondi 4 model, but you can't beat 50% off sometimes.) 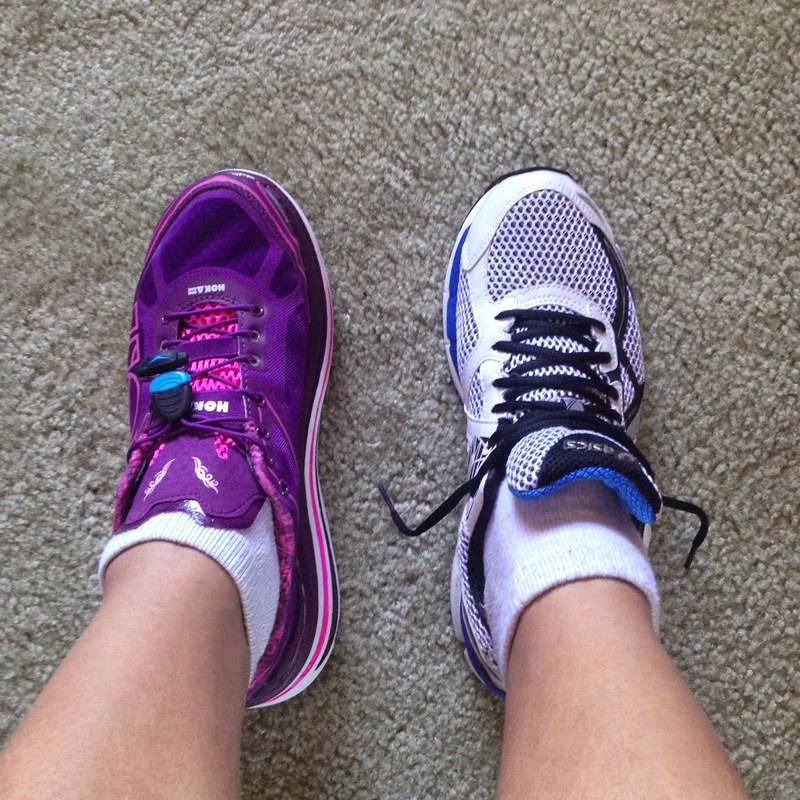 I know, I know, I shouldn't buy running shoes sight unseen, but I just couldn't pass up the opportunity. And look, they're cute and purple! 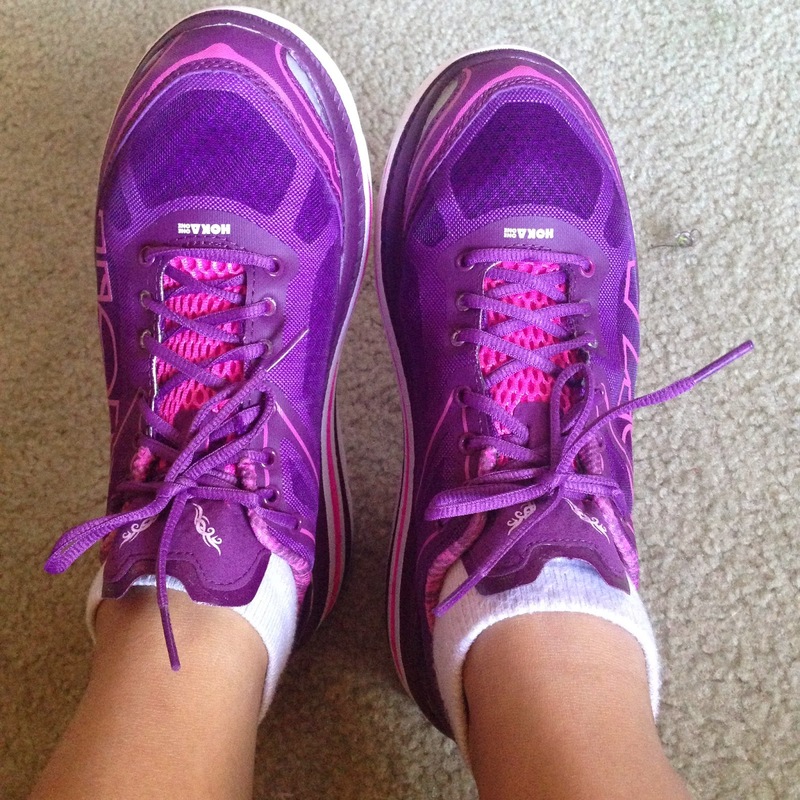 After running in men's shoes for the last few years, I really wanted cute running shoes. I figured the cute colors would balance out that ginormous sole. IDK. Straight out of the box, they come with additional, thinner insoles for people with wider feet and a set of regular laces, in case you want to replace the speed laces that they come pre-laced with. The upper is mostly a fine mesh on top of a larger mesh, so it's very breathable, and the tongue is thin, compared to most running shoes I've tried. I suppose that has its ups and downs. There are two elastic straps that run across the top of the shoe, presumably for holding the slack/cinchpiece for the speed laces. I put them on as is, and they were... pretty snug. I could probably live with it as a street shoe, but definitely not for running. I switched out the insoles to the thinner ones they provided, and that helped a lot, but of course, I knew that I would not be able to get the fit I wanted until I made some modifications: you cannot remove the speed laces without cutting them, so I snipped those, and I snipped off the the elastic straps too, since they were no longer needed, and I wanted more wiggle room. So... and here's where you can start telling me "I told you so"... 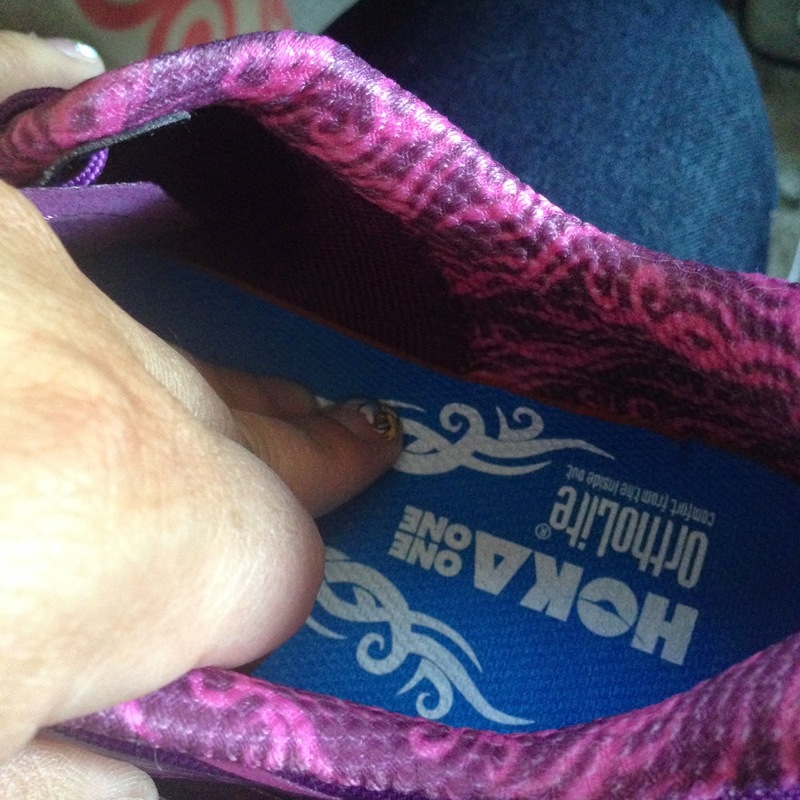 I have plenty of room in the toe box for all my toes except for my little toe, on the outside of the shoe. 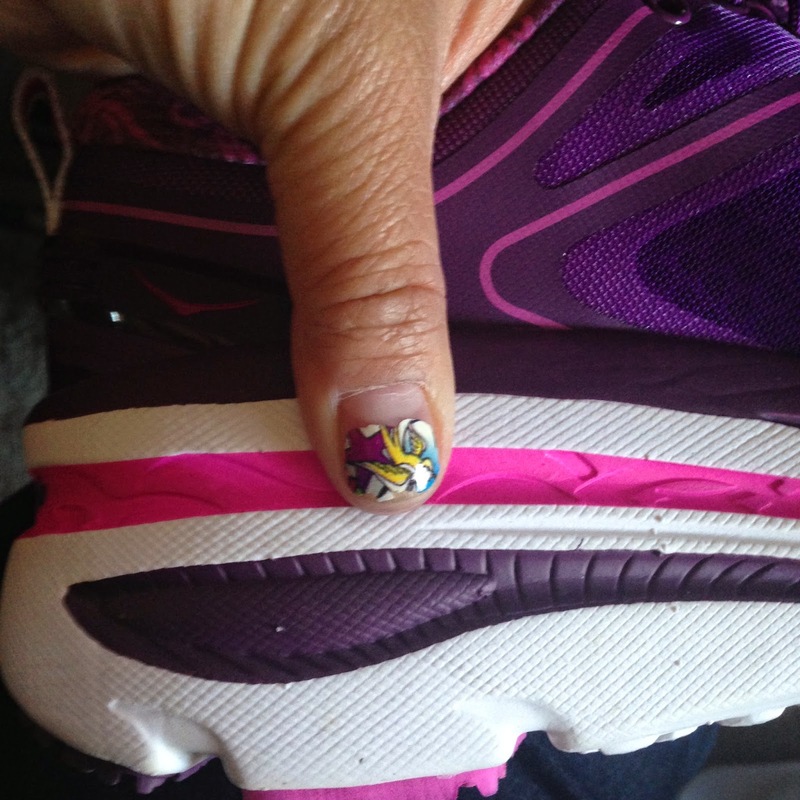 My little toes were comfortable, but without much excess room, which probably doesn't bode well for super long runs. We'll just have to see. If I buy these shoes again, I will go up an additional half size. Where the tip of my thumb is, that's where the bottom of the shoe is inside. And where the tips of my fingers are, that's where the inside of the shoe starts to curve up, that's like, the edge of the flat bottom of the shoe. 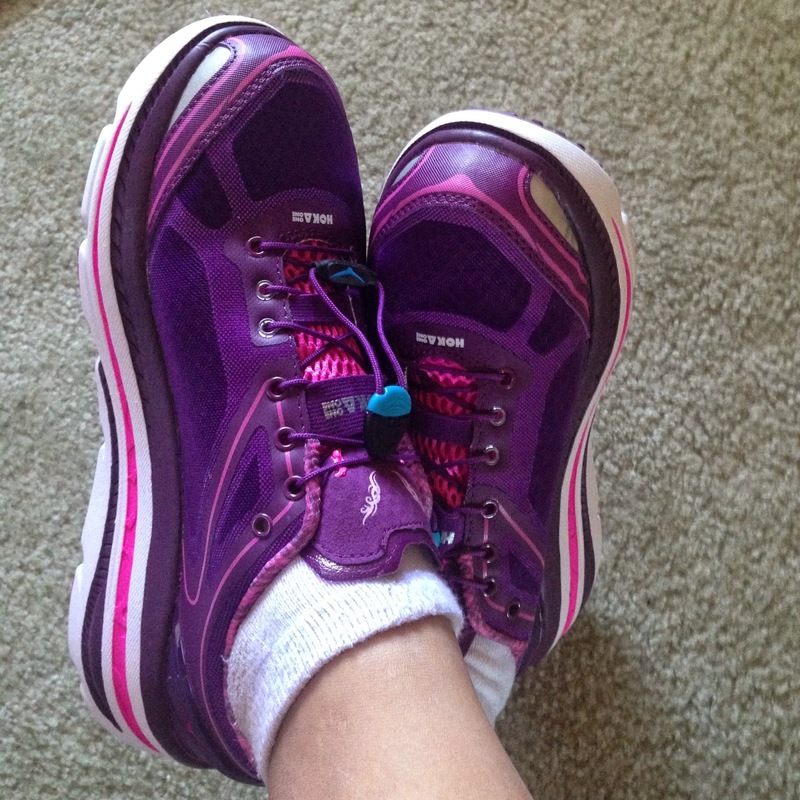 I took them for a test run this weekend - I mostly walked (but ran some too - still recovering from a lifting injury) a 6-miler this weekend, and it felt great. I didn't ever feel like I was in danger of rolling my ankle or anything. The only ouch factor I experienced was that I developed a blister on the back of my foot (like, where my Achilles is), but that was a combination of the back of the shoe as well as the dust/debris that had found its way into my sock. Hopefully with a little creative bending, that won't be a problem. My toes all felt fine. 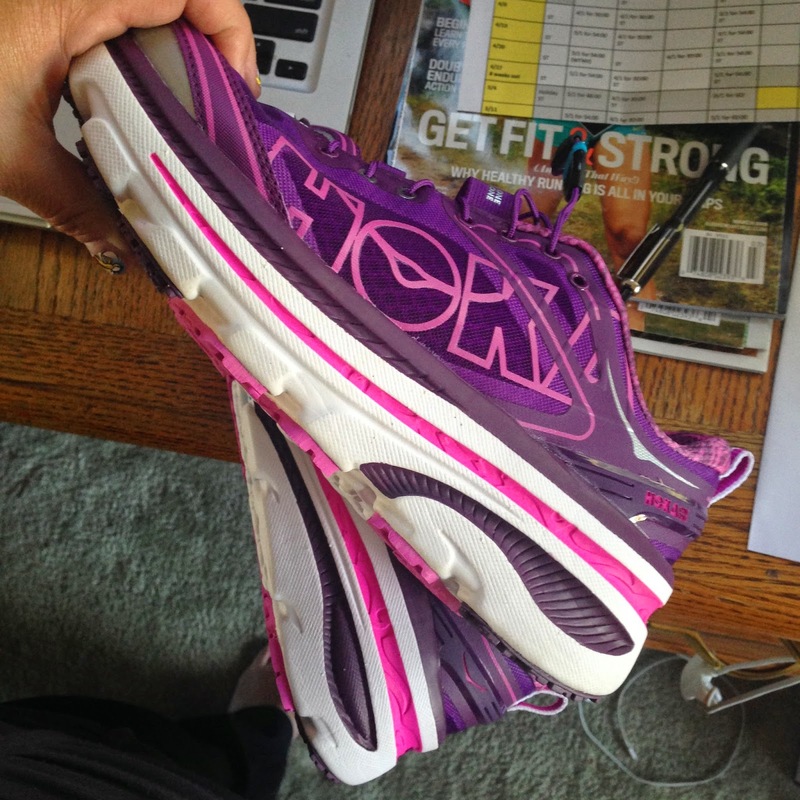 Since they passed the shorter test, I will take these out for a more intensive 10-miler next weekend. So far, so good, Hokas. You will live to see another day.